Rapid City lies east of Black Hills National Forest in western South Dakota and is known as the gateway to Mt. 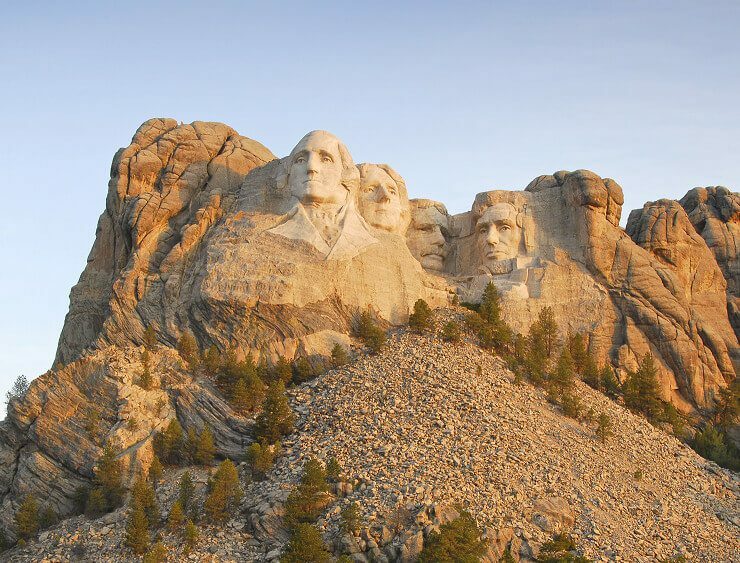 Rushmore, the massive iconic sculpture of 4 U.S. presidents. At the heart of Downtown is Main Street Square, an ongoing public art project lined with restaurants, bars and shops, music and dancing. Visit the Journey Museum & Learning Center, with local history and geology exhibits. Within an hour’s drive are six national parks and monuments. Explore the mysteries of the Badlands National Park and Minuteman Missile National Historic Site, established in 1999 to illustrate the history and significance of the Cold War, the arms race, and intercontinental ballistic missile development. 71,000-acre Custer State Park is home to a diverse range of wildlife including bighorn sheep, antelope, deer, elk, coyote, prairie dogs and “begging” burros. Deadwood is unmistakably a gambling town but there’s plenty of history there too, including the graves of Wild Bill Hickok and Calamity Jane.